According to the U.S. Department of Agriculture, in 2008, the average American household spent roughly 9.6 percent of its disposable income on food. That’s a couple of thousand less than the typical household spent for transportation, and just more than double what it paid for entertainment. A tenth of the family budget may sound like a lot to eat in a year, but things could be worse. Back in 1929, when the feds started keeping track, the figure was closer to 25 percent. I am descended from a bargain-buying people. I don’t think my very stylish mom has bought an outfit at retail price in 40 years. Until I was in my twenties, I thought “Easter Monday” was a Jewish holiday because she gave me bunny-shaped chocolates after they’d been marked down. Those penny-pinching ways were transferred to me. When I moved out on my own, I purchased plates, bowls, glasses and cutlery at the Christmas Tree Shops in Williston. When it comes to food, I always look for a bargain. I buy marked-down lamb after Easter and freeze it. Day-old bread is just fine with me. Last summer, Suzanne persuaded me to split her Pete’s Greens farm share, promising big savings. It was fun unwrapping my produce surprises each week, and I loved playing “Iron Chef” with ingredients that were new to me. I became a master of garlic scapes. However, I still had to buy fruit, meat and pantry staples at the grocery store. Turned out I was losing money with the farm share, not saving it. Also, dining out as much as I do, I wasted a lot of beautiful produce. I would leave bags of past-prime veggies in my fridge, hoping I’d get around to eating them eventually. The result? The turnip-green equivalent of the Shroud of Turin plastered to the bottom of the produce drawer. Around that time, my boyfriend, James, developed a curious habit: He stopped asking me to pick up stuff for him at the grocery store. Why? While buying our cats’ food at Big Lots! in Essex Junction — part of the national chain of “closeout retailers” — he’d started stocking up on his own sustenance. Years ago, James had become attached to Taste of Thai peanut noodles purchased on the cheap. Now he broadened his lunch repertoire to include SpaghettiOs and cans of Campbell’s Chunky Sirloin Burger soup purchased for $1 or, on a good day, 80 cents. He was snacking on Snyder’s Hunger Buster BBQ chips (marked down from $4.49 to $2.50) with Valentine’s Day chocolates for dessert. I have a history of finding good quality pantry staples — balsamic vinegar, interesting cooking oils and salts — at bargain spots such as HomeGoods and Marshalls. Could I snag enticing items at even lower prices? I headed to Big Lots! to find out. In the snack aisle, I found oddball options, to say the least. I skipped the dill-pickle-flavored sunflower seeds, even though they sported the appealing tagline “Eat. Spit. Be Happy.” Then came enough varieties of pork rinds to make lovers, or haters, squeal, and cheap popcorn with a picture of Garfield on the label. Do people still care enough about Baby (aka Birdman) to purchase Rap Snacks with his grill leering from the bag? In the next aisle, filled with sweets, more tantalizing stuff appeared. A Romanian chocolate brand called Grand’Or offered big, 70 percent cacao bars in flavors such as key lime, passion fruit and orange-coffee for $1.50. My favorite midafternoon snacks are 90-calorie Quaker Chewy Granola Bars in chocolate-cherry. Big Lots! was stocked with chocolate-only ones. The “Fright Night” version. With ghosts. I realize most people might be spooked by eating Halloween candy at Easter, but I dig the reminder of my favorite holiday. Besides, granola full of chemicals takes a really long time to go bad. I also saw why James likes to buy his sugary cereals at Big Lots! : Cinnamon Toast Crunch, which the Walgreens website pegs at $3.49, is a nice round $2.50 there. I love heating up a 150- calorie bowl of Betty Crocker Warm Delights molten chocolate cake for a quick treat. At Big Lots! I could get two of them for $1.50. But I was seeking the basics. I was thrilled to discover my favorite Barilla Plus pasta, which cooks to a nicer al dente than any other commercial spaghetti I’ve tried, for $1. The store had plenty of other appealing noodles, mostly imported from Italy, plus hefty cans of San Marzano tomatoes with basil, my favorite for a quick weeknight tomato sauce. Big bags of panko were $1.50, and boxes of del Valle mango and guava juices, which I use to sweeten sauces, were $2. I haven’t eaten a Nissin Cup Noodles since middle school, when I exhausted my tolerance by slurping them daily, but the 33-cent price tag made me reconsider. One packet may account for 53 percent of my daily sodium, but perhaps I should think of it as “sodi-yum.” Speaking of salt, if you’re cool with eating a whole meal out of metal, Big Lots! 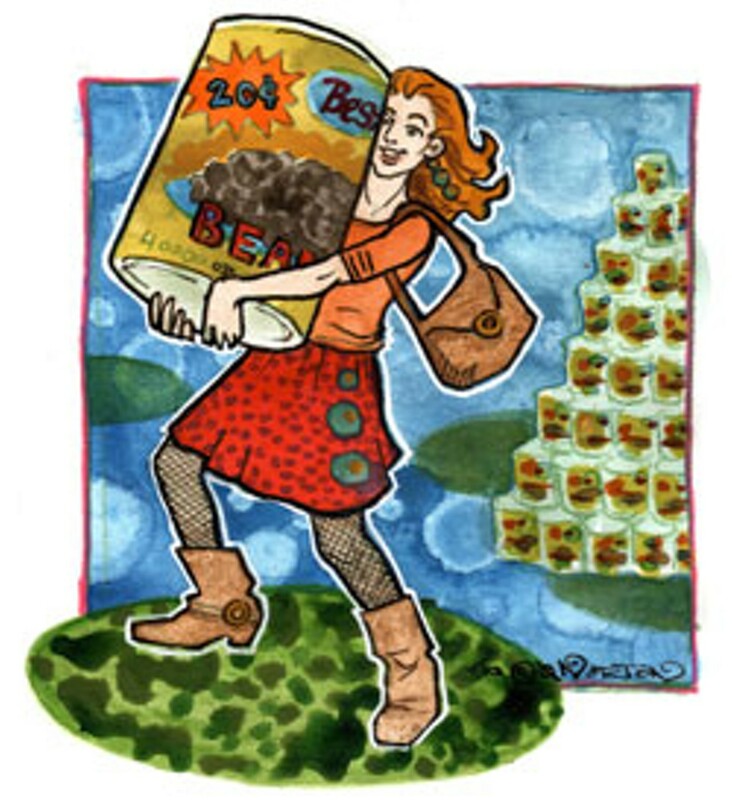 has plenty of canned meats — including Spam with Cheese — and veggies. For my part, I think I’ll keep getting fresh produce from Healthy Living or my local Shaw’s. Finally, I found enough spices to build a small pantry. I had to pick through lots of chicken- and beef-flavored seasonings, but managed to find cayenne pepper, cinnamon, paprika, oregano and nutmeg for $1 each. Few feelings thrill more than ringing up at a store like Big Lots!. With loads of 50-cent cat food cans and cheap litter, paper towels and a few of the aforementioned staples in tow, I don’t think we’ve ever had a bill of more than $20. I think the government should replace food stamps with Big Lots! on every corner, like Starbucks for those who can’t afford to drop $4 on a cup of coffee. I know I’d bite. When I try convincing people they can afford local, organic food, they look at me like I’m peddling Grandpa Joe’s Cure-All Elixir. If there’s one thing that liberal advocates for the food insecure and Joe the Plumber agree on, it’s that froufrou Alice Waters types are deluded. The localvore movement is elitist, both camps suggest. Neither working inner-city mothers nor stolid middle-class Americans can afford — or need — arugula (just ask President Obama). But, while it’s easy to drop lots of green on local food — especially those $25-per- pound artisan cheeses — you don’t have to. I know, because I didn’t always eat this way. I may sometimes sprinkle truffle oil on my mashed potatoes and keep Spanish paprika and Tahitian vanilla on my shelves, but I wasn’t to the manner born. Like many children of the late ’70s and ’80s, I grew up eating cozy American meals of mac ’n’ cheese and franks ’n’ beans occasionally punctuated with more exotic fare. Ingredients were whatever we found at the grocery store. It wasn’t until City Market took up residence three blocks from my old Pearl Street apartment that I gave more than a passing thought to the provenance of my produce. Midwinter, I noticed bags of braising greens from a place called Pete’s Greens. I was intrigued to see vegetables in Vermont in January, and found the leafy mix more flavorful than my usual California baby spinach. But, as I shifted my buying habits, I found I was breaking the bank. Browsing towers of fruits and vegetables, I’m often seduced by mysterious — and pricey — items. Organic purple-tipped baby artichokes and lobster mushrooms found their way into my fridge. All too often, they never found their way out. These produce-department flights of fancy were costing me an unsustainable $50 per week for two. Add chicken, beef, cheese and grains to the list, and my grocery bills surpassed my rent check. Then I found the solution: investing in a weekly farm share (often called a CSA, for “community-supported agriculture”). These days, many growers offer them year round, with hearty root crops dominating in winter and heirloom tomatoes and herbs in the summer. Prices range from about $16 per week (enough veggies for two) to $85 for packages of produce, meat, eggs, bread and cheese that will amply feed a family of four. Sure, I talk up CSAs because they suit my ideals — their wares taste good and make me feel good about supporting local growers. But it didn’t take me long to realize that they also save me cold, hard cash. Since I first got an Intervale Community Farm CSA share in 2005, I’ve been shelling out less for food while eating better than ever. A Pete’s Greens “Good Eats” share, which my husband and I split with another couple, gives us all the veggies we need plus loads of other localvore goodies for just $22 weekly all year. The white flour, balsamic vinegar, raw honey and tamari in my pantry — all local and artisan produced — came from my CSA’s one-stop shop. Add a Jericho Settlers' Farm meat share that rings up at $11.86 per week and $10 gallons of creamy raw milk from Bread & Butter Farm, and we’ve got most of what we need. Sure, I still shop. If we’re flush, I’ll spring for fancy jams, well-marbled grass-fed steaks and plenty of Vermont cheese. When things are tight, a not uncommon situation, we can get by on less than $20 worth of staples on top of the CSAs for a grand total of $64 per week — just a bit more than I used to spend on produce alone. If things were desperate, we could lose the meat and milk, base meals on legumes and whole grains, and still eat a delicious, balanced diet for about $35. With 24 different CSAs offered in Chittenden County alone, there’s something to fit nearly every budget — and different tastes, too. 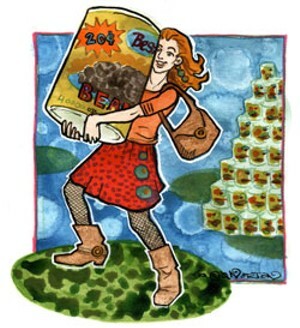 Some customers love to be surprised at their weekly pickups, but not everybody thrills when they spy a full-to-bursting sack of wheat berries or a bubbling crock of lacto-fermented sauerkraut. So, while some CSA providers shoot for diversity, others stick with tried-and-true favorites such as cukes, lettuce and carrots. 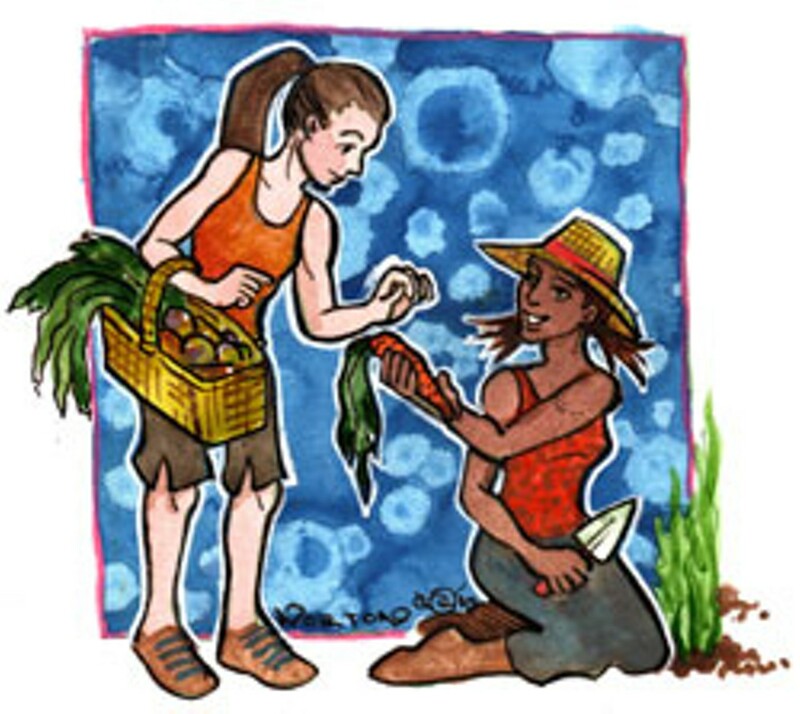 The Northeast Organic Farming Association of Vermont (NOFA-VT) helps make shares accessible to those who can’t pay full price: People who qualify for federal benefits can purchase CSAs for half price at participating farms. Qualifying seniors can pick up a small portion of produce each week for free. A handful of farmers accept EBT cards, and still others have member-worker programs to reduce costs. The NOFA-VT website elucidates all the options, including which forms of financial assistance each farm offers. As much as I love my CSA, there are some trade-offs. I’ve ceded much of the control over what I eat to a handful of virtual strangers who live in Craftsbury. I get more red onions than I need, but not as many salad greens or eggs as I desire. In cold months, I make a lot of borscht. And, on the rare occasion when I want to follow a recipe, I’m forced to spend extra to get the ingredients I need, while the share I’ve already paid for languishes in my fridge. To me, though, those seem like small prices to pay for the benefits — culinary and environmental — that being part of a CSA affords. The fact that shopping and eating this way saves me money is icing on the cake.